What If Jack Kirby And Stan Lee Had Created Akira? We've seen numerous western superheroes drawn in the styles of Japanese manga artists, but what if famous Japanese characters had been designed by American artists? Jack Kirby's take on Akira might have been an American version worth looking at. This week, Comics Should Be Good challenged its The Line It Is Drawn artists to draw Japanese comic characters in the style of American cartoonists. 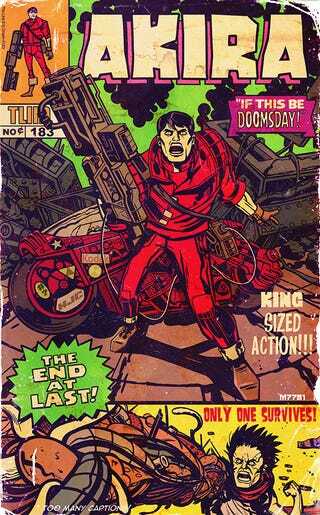 This Kirby-fied Akira was drawn by Marco D'Alfonso. Over at Comics Should Be Good, Lupin III also gets the Kirby treatment, while Battle Angel Alita steps into a 1970s Big Two comic, and Dragon Ball Z's Super-Saiyans are filtered through a Rob Liefeld lens.